Drawing from memory is an advanced artistic skill, one that comes only with practice. You may find your early efforts disappointing. If you're struggling with the process of copying a photograph or a sketch in an art lesson accurately, then your memory drawings may have serious errors that won't be corrected by checking against what you're drawing. Even at an intermediate level where life drawing becomes true and accurate, drawing from memory is more difficult. It's easy to forget things like which direction the light was coming from or to put shadows on all the objects in the picture. Yet this skill is essential to artistic growth. Practicing drawing from memory even when the results aren't as polished as your life drawings and working from references teaches something every time you goof. This exercise is all about goofing, noticing what the goof was and remembering not to goof the same way the next time you draw that subject. This is a process of successive approximation. If you start drawing from memory right away though, alternating it with the ease of tracing and coloring photos, the accuracy of life drawing and the vitality of combining photo references in Photoshop till you get a good composition, it will stretch your imagination. Eventually you'll have enough experience that when you want to alter the photo or change the landscape you're drawing from en plein air, it comes natural to just put a cloud here or move a tree there. Below is a drawing I did from memory. It just started as two loose circles to represent fruit. 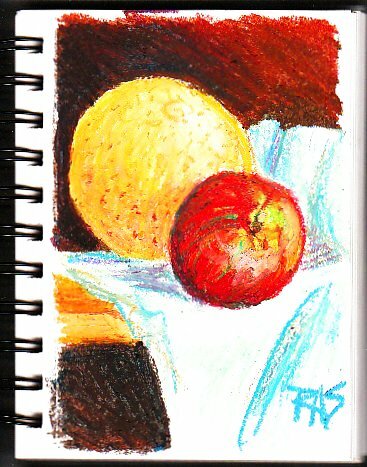 I was working from one of the demonstrations in How to Paint with Oil Pastels by H. P. McLaughlin, just goofing off really -- but I looked at the example and didn't like the way McLaughlin did the apple. The memory of the apples from our tree in the back yard came rushing back. It wasn't that McLaughlin's apple was bad or wrong. It was just someone else's painting, and I wasn't in the mood to copy someone else's painting. So I closed the book and sketched in a second loose circle to place another fruit so that they'd make a good composition. I built up the shape of the cloth under it from the memory of dozens of times I've looked at cloth draped over things and falling off shelves -- and from the memory of some extraordinary still lifes by Rembrandt and others where white or light cloths were used to contrast with the subjects. I liked the dark backgrounds of the Rembrandt paintings. So I drew in a dark background and started changing colors as I moved across it, remembering how rich the backgrounds looked in my soft pastel Colourist paintings if I shifted the hue without changing the value and used it to push the light. I grew up hating grapefruit and grapefruit juice in the mornings. They were served almost every morning during my childhood, so the memory was vivid. Because I paid that much attention to the fruit at the time, I was able to draw from memory -- from memories decades old, from long before I learned to see like an artist and draw what I saw. Drawing from memory can do that. It can unlock the visual richness of memories from all the times you saw something beautiful and wished you could draw that. Every time you draw from memory, you are retracing that memory and strengthening it. Looking at it again in your mind's eye, you will see things you didn't notice at the time because you didn't understand them. I visited some beautiful places in my childhood on annual trips out West. I visited some extraordinary places in California as a young adult, even brought along a pocket watercolor set to paint them. The resulting plein air sketches were ludicrous. At the time I was too caught up in details. So I'd have an entire page of my watercolor pad devoted to a perfect little pine branch in the upper corner, or just the tip of a mountain -- sometimes not even a line for the horizon, just this odd little study. I'd open the sketchbook and remember the way the beach looked even though no one else looking at it would think "beach" from seeing a pine branch by itself on a mostly blank page. The longer I practice drawing from memory, the more likely I will someday revisit that beach in mind and capture the unique line of the lakeshore, the way the rocks looked tumbling around, the pebbles in the sand and the distant mountains with their treeline and distance-blued bare rock above it. The place may have changed. The lake may have dried up or been dammed. Some of those forests might have been cut down. With enough practice I will be able to see it again and draw it from memory, completing what I began in the watercolor sketch. So try drawing from memory. Don't worry about your first results, just date them and keep trying to do it regularly. The more you learn about accurate rendering, the clearer your memories will become and the easier the process of accessing old memories. Sometimes it helps to focus on something specific in a memory. Thinking about the color of an apple rather than anything else about it can help your understanding of color. Drawing it from memory in oil pastels is a good exercise for remembering hue and value -- essential if what you have after a trip is the photo of something you've seen. Your memory is potentially far more accurate than any photo. Photos are good for showing details and general lines. They are crammed with a lot of detail unless it's in macro mode where it'll start softening right away after a short field of vision. Drawing from memory can sharpen that fuzzy blue bit that was another flower to the detailed shapes, veins, shadows on the petals and the accurate hue that was blue-purple instead of bright blue in life. One thing that helps for drawing from memory is to draw the subject several times with references or from life. The more practice you get in doing apples, the easier it'll be to draw an apple from memory and just put it where you want it in the picture. We have an apple tree in our yard and always have apples in the house, when it fruits we have our own copious apples. I loved how our apples looked from the very first year we moved in, and every year I've been sketching them. Today, I sketched one long after the last of the most recent harvest has been eaten or stewed or made into pies. Even the grapefruit led to a happier memory -- the Ruby Red ones have more blush on them and a warmer color, less lemony. They are actually tasty to me if I put a good 3/4 of an inch of sugar on top and half a dozen maraschino cherries on them. So as I drew the grapefruit, it changed from the bitter yellow grapefruits of childhood to the occasional treat of a Ruby Red with cherries and tons of sugar that I enjoyed in the eighties when no one else was watching my weight. I even picked up a can or two of unsweetened grapefruit juice on the cheap -- why that is so much cheaper than other fruit juice is beyond me -- and found out that could be tasty too if I put in a shot of Grenadine syrup to sweeten and color it. Drawing from memory will sharpen your memory, improve your ability to see like an artist and help you create anything you want. My still life became as original as it gets, even though it's just a simple little study. Those particular fruits came out of my head and that shelf they're on was the memory of every shelf I've ever seen. With this practice, it will also become a good mental habit to start changing your references. Using photo references from magazines, advertisements or TV programs runs the risk of copyright infringement. Even if it's just one frame in the middle of a documentary on lions, you can't just copy that frame exactly without infringing on the rights of the filmmaker. However, if you're not copying the photo but just using it as a starting point, you can use any reference that catches your eye. The more practice you have drawing that subject, either drawing from memory or drawing from multiple references, the easier it is to look at that frame, crop it, change it, maybe put a different animal in and move the trees... then you are not infringing copyright because you're not actually copying anything. You just got an idea from one image and built it up out of many remembered sights including the first time you saw a lion in a zoo, every other documentary you've ever seen, National Geographic articles, drawings by Old Masters and paintings that you liked. So give it a try. Drawing from memory is tough but rewarding. Have fun and count your successes -- learn from the failed trials but count every success with pleasure. The fact that you did any drawing from memory is a success to take pride in.